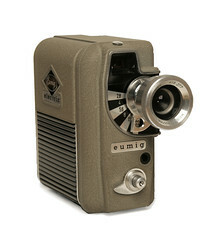 Eumig was an Austrian manufacturer of electric and electronic devices, especially famous as manufacturer of amateur movie cameras and movie projectors. It also made some still cameras. It was founded in 1919, began production of its movie cameras in 1931, and had plants in Wiener Neudorf, Fürstenfeld, Fohnsdorf, Kirchdorf an der Krems and Bad Deutsch-Altenburg. It was closed after bankruptcy in 1981. In 1989 the Frankfurt based company Rothenberger GmbH bought the rights for the brand Eumig. It is specialized in TV-cameras for inspections of wastewater pipes, wastewater channels and hoistways. This page was last edited on 23 July 2016, at 08:32.